Why do you collect/build armies? when i came out of my dark ages 2yrs ago i could only shake my head when i've read about people who buy single figures only for the purpose of "army-building",well couple of month later i've started to get as many Stormtroopers as possible and when LOTR came out i couldn't resist to get as many Rohans as i could get to build a Rohan-Army! I have no idea if i will ever build a MOC which incl.one of these "Armies"and i have no idea why i'm so keen on these! When does somebody stop getting more of one fraction? And what is it that make some people collect Armies? Please share sour thought on this,wether you collect armies on your own,or if you totally dislike! My experience with legos growing up was using individual blocks (I had ADD and couldn't spend the time to sit down and go step-by-step with the instructions) and building forts and bunkers to house my green army men. I then would then split the armies into two on separate sides of the room and proceed to throw golf balls trying to knock over and "kill" the army men! I am shocked that the Lego Toy Story army men in #7595 were largely passed over by kids/AFOLs/investors in secondary markets! I would have LOVED having an army of these when i was younger! 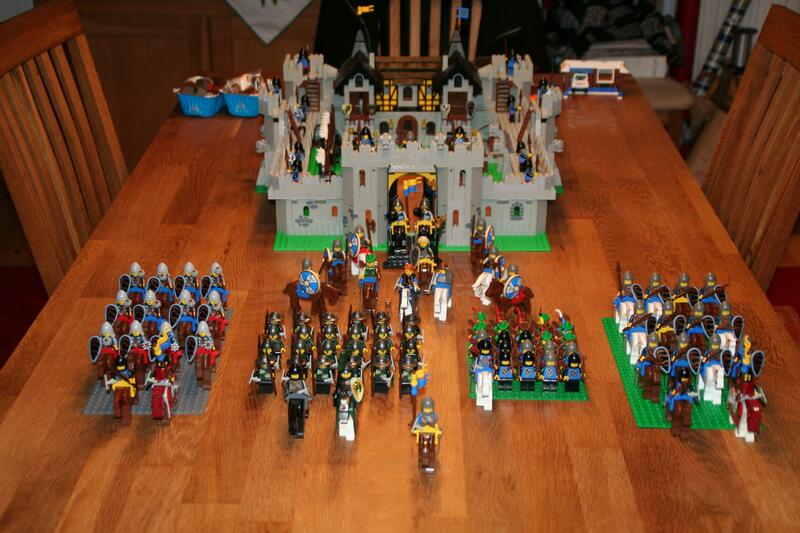 As they grew out of them I inherited the entire collection, and by the time I outgrew Lego I still set up all of the castle soldiers on my bookshelf. By that point combined I had 273 total soldiers, knights, and civilian "teamsters." When I came out of my dark ages the first thing I rebuilt was all the old castles, and set up a massive battle over the Black Falcon Fortress (combined with the Knight's Castle, armorer's shop, and a couple other wall segments...love those early modular castles!) The display of this "battle" was sprawling and epic, and the sort of thing that can only be achieved through massive numbers of soldiers. And don't get me started about the French soldiers from the pirate theme...As a kid I was more and more interested in the Napoleonic era and never could seem to get enough of those guys. This past summer I found at a garage sale a tote that had four more of the soldiers, and like a little kid I couldn't wait to run upstairs and put them with the rest. This Army-builder"trend"seems to grow and grow and TLG even responds to it with their several "Battle-packs"! @kez. Same here, it is really only money factor that has stopped me from buying as many Uruk-Hai as I can get my grubby little hands on. At present I think I have around 20. Funny, I've built armies myself always thinking I'm going to build this great moc. I had close to 400 clones at one point, have a lot of snow troopers and rebels, and now a lot of Uruk-Hai. And i guess you'll never reach a final goal?! Btw,it's a pretty smart move from TLG to only put one stormie in the battle-pack,people have to buy multiples over multiples to get even a decent amount of stormies! And of course it's the most expensive and highest desirable figure out kf this package! I need to build an army to battle my current army. Kids love having huge armies especially with star wars as it allows them to recreate the battles that they see on the tv or in films. Its why you see lots of clone army etc videos bragging about the size of their clones. Plus why Cuussoo had any number of army builder mocs. Plus boys like playimg soldiers and having epic battle. As testified by the huge number of toy soldiers, I had as a child, waging war on each other. Mainly the empire trying to crush rebels. Whether this is the precise reason adults carry it over depends. But lets face it the King would look really bad if he only had three or four knights. Plus if you MOC then it is a great way of adding people to a scene or even just improving an existing set. Although if lego release the castle lines I would love a ordinary folks battle pack. The battle packs are also a great and cheap way for parents to add playability to sets. Keeping kids interested in the sets. I think one of the base urges people often have is of making something truly epic-- kids usually want to build a HUGE castle with all their LEGO, or want a REALLY big tank that could drive over buildings and crush them. There's a strong desire to make something that will make a strong impact, and we usually associate size with that. For some people, that huge thing will be army size. Armies are relatively low-effort to build (each fig is only a few elements), and are configurable in many patterns to inspire differing degrees of scale and reality. Plus, there's no end. A large MOC you've got to plan in advance-- it's difficult to keep adding to it. An army you can keep adding to endlessly, so you can imagine that you've only just started. So, I think armies offer a lot of attractive features that lure us in to achieving something grand in scale and imagined power. It's interesting to look at LEGO's strategy in this department, actually. In ye olde days of the 1980's and 1990's, there were minifig packs that featured generic "army-builder" type figures. But in the late 1990's and early 2000's, they either didn't produce many, or produced kits with many specific characters rather than generic ones. 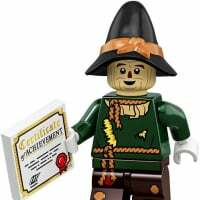 I recall one LEGO employee saying that the feedback they got for pitching the idea of collectible minifigs (back in the early 2000's) was that it was a bad idea for LEGO, because they were a "building toy company" and not a "minifig company". IE, they didn't believe that the minifig was a core component of their product! Go figure that they were slumping during that period of time! But now, LEGO's really gotten the message. Since 2005 or 2006 or so, they've really gotten on board with the power that the minifig carries with their brand, and seem to have exploded with army-builder packs. And the collectible figs (while not an army builder) are one of their most successful products! So they've really started seeing the very common appeal of army building and have really started catering to it very nicely! For me, it's definitely the idea of a great MOC one day. I hope to make an amazingly large Helm's Deep scene one day and need as many Uruk-Hai as I can collect. That said - and based on personal experience - I'll probably just end up with the large collection and no MOC. But still, I enjoy amassing the troops. It's sort of the what-I-didn't-have-when-I-was-a-kid factor. I staged what I thought were epic battles around my King's Castle. Those epic battles consisted of about 20 total warriors. Not that I have the means to make it a much bigger war, I have that dream. Well I am making a small mideval army to go with my castle sets. I have been doing this by buying Kingdoms Chess sets. For me it just goes with the theme and the mideval sets are my favorite. I may only add one or two more chess sets to my collection... My only gripe is the Jesters for bishops. Now for those who have thousands of clones or stormtroopers... Good grief! next thing you know they will be building a minifig scale deathstar for them to populate... Royal shuttle landing scene anyone... In scale? Lego Wargaming! Rebels only have 25 turns to evacuate everyone. Empire can win if the MF gets overrun and captured. 1) To populate MOCs (mainly castles). I have Roman, Conquistador, Spartan, Elf, and then Castle figures and knights. All these can live in the castle, although not together. The chess set is a perfect way of getting a cheap castle / knights army. I do also have some slightly odder "armies" - gorillas, lizard men, spacemen, galaxy patrol, minotaurs, butchers, aliens, business men, etc. 2) Because I like the regularity in a display. A well built army in a highly symmetrical format looks amazing. For me, an army needs to be in a multiple of four. Four minifigs wide fits perfect on a 16 wide plate - they each get four studs, so there is room for weapons / shields / etc. I don't allow new minifigs to join until there are four of them, as they break the formation. And an army needs to be at least 16 minifigs, anything smaller than a 4x4 formation to me is not an army. I also like my professional armies to be properly equipped, so all of the minifigs must be wearing the same uniform or armour (eg no homemade romans). But then I vary their heads, so that they look more realistic. Whereas the barbarian armies can be made from a range of different minifig parts to break the regularity, and I tend not to align these in strict formations. I built an army of hazmat suit guys and wharf fishermen (about 25 each). They look great at the bottom of their storage totes... awaiting a day when I can build a moc for them to live on. I think it is more of an addiction for me... at least I'm being honest about my downfalls in army building. ^ I was thinking about picking up some hazmat guys. Who knows what kind of radioactive stuff aliens bring with them. Plus they can do double duty with zombie cleanup. I would love to see some people's lego armies. I have squads, but not enough to call an army. I'd like to gather up more super heroes minions (ie hydra, ultrons, or shield). I have a squid of foot soldiers from TMNT. We will see what the next castle line brings. Maybe it will have some neat figures to army build with too. that's my concern! the kingdoms theme at first glance wasn't too appealing with that massive castle but at second sight the minifigs were and I bought quite a few of the battlepacks. It is probably an addiction which LEGO has found ways and means how to service. I'm not condemning it as long as you get your bang for the buck. It could be like collecting stamps, neat little items which you arrange in a collection. Somebody named it further up/earlier, it is nice to view them sitting at the bottom of the box. I couldn't agree more, nice to view the warriors sitting in their drawer. Where I put them when I'm done. Why I army build probably originated when I was little and GI Joe consumed me. I used to want to have an army of Cobra troopers, but never got more than 2. When GI Joe was re-released years ago I built the small army that I never had. When I got into Lego, army building made sense because of the scale and relatively lower cost. I hear of Warhammer type gaming, substituting the figures for minifigures. West end games (now defunct?) Used to have a miniature battle game so I have the rule book for that. (Never got around to playing it) I have around 100 Toy Story army men that I switched the heads and hands out of. If I ever get around to it I will build my Emerald Night train with extra passenger cars, and flatbed cars with the Jeeps loaded on them. There are several others floating around out there, but this is fairly comprehensive.